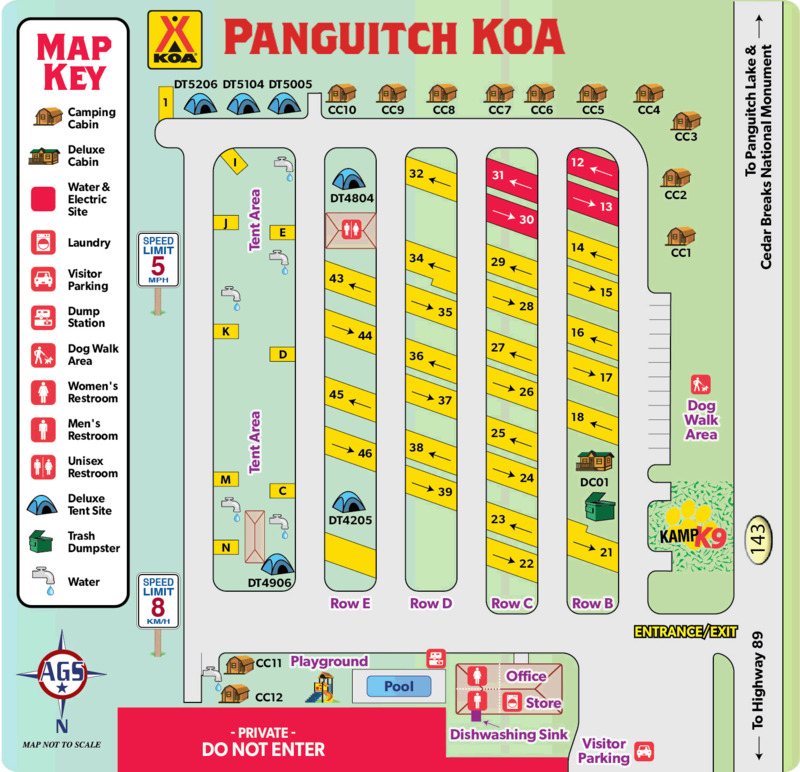 Ask fellow campers about "Panguitch KOA" and nearby attractions. We stayed one night in October 2018 in our 43' fifth wheel. The nightly rate was $40.40 including all taxes and with a 10% KOA ValuKard Discount. Site included FHU, 50A, water with decent pressure and free WiFi. The wife reported back that the restrooms were spotless and well stocked. We didn't use the laundry or pool. Our pull thru site was mostly level, gravel and all utilities were positioned off door side, nearly mid-site and conveniently grouped. The site wasn't long enough to remain parked in front of my RV but was wide enough to park beside it. The staff were very friendly and helpful, assisting with parking. Be aware that coming in from either direction will include a really good climb with steep grades and sharp curves. Just take it slow and easy and you'll be ok. The park is located near Bryce (24 miles) and Zion NP (60 miles) making for easy day trips. I'd stay again and stay longer to explore the surrounding areas that time didn't allow this trip. We camped at Panguitch KOA in a Fifth Wheel. We had an excellent site but were unhappy with the woman in the office when we checked in. We arrived before check-in time. Our site was not occupied but she didn't want us to move in to the site because they were still watering the lawn there. We said that wasn't a problem, they could leave the water running. The man who would show us to the site was willing to turn off the water and lead us to the site. It was very windy there and the dust from the campground roads was really bad. We will find another place to camp if we return to this area. We camped at Panguitch KOA in a Travel Trailer. Very small old KOA right by a railroad track. When we got there, no one was visible other than a small dog running around. Owner was in the back. On large river and with 2 dogs who love water was why we booked this site. However, river swollen and dangerous. Lots of lush area to walk dogs. We camped at Panguitch KOA in a Fifth Wheel. A very small town, plenty of tourist things to do, good grocery store down the block. All services and facilities worked very well. Looks like an additional restroom/shower was added for convenience. This was appreciated, but needs to be heated! We camped at Panguitch KOA in a Travel Trailer. Convenient location for Red Canyon and Bryce Canyon NP. Panguitch is a nice town with convenient shopping and restaurants. Great RV Park, out on the edge of town. Water pressure was good, no noise at night, spaces were short, big enough for our 36-foot, but we had to park across from our RV. Nice parking space. Trees for shade. Pool looked nice. Store was stocked with the necessities. We would definitely stay here again. Mail was delivered to our door, which was great, since we had a bunch of boxes. Managers were very nice. We camped at Panguitch KOA in a Fifth Wheel. Nice, small grocery store in town. Was able to finally get my hair cut at Rumors - very pleased. Had pizza delivered by C-Stop. Very good. A drive to Red Canyon and Bryce, but not a bad one. Same with Cedar Breaks. Ate at Cowboy Buffet at Ruby's. Food was very good, especially the salad bar. We stayed in a 38' motorhome. Sites are uneven and gravel/dirt. Wind comes up every afternoon so the area gets very dusty. We camped at Panguitch KOA in a Motorhome. The area is subject to high winds and dust but the management couple are really nice. WiFi is spotty at best. Great location to many of the national parks. Lovely, quiet, easy access. Lots of space for our slide and awning. Picnic tables were new. Well maintained. GREAT tent sites and little cabins. The pool was not open yet - but looks clean. Friendly staff and the restrooms and showers were sparkling clean. Great location - Will put it on our preferred list for visiting Bryce Canyon, Red Canyon, Zion NP and Escalente Staircase. Lots of grass, trees and song birds. We camped at Panguitch KOA in a Travel Trailer. We stayed here for 4 days while visiting Bryce & Zion - Bryce is closer but the drive down 89 to Zion is beautiful - wouldn't have missed coming in from the east entrance for anything! The campground is clean and convenient; staff is friendly and helpful. Our site was level and everything worked great - even the wifi which is unusual. We used antenna for TV and got great reception. Pool wasn't open yet but we had a lot to see. The town is small but has a couple of stores. Not close to any city of size. We were here in April and it froze overnight so make sure you're winterized if you come before May. We camped at Panguitch KOA in a Travel Trailer. If you're booking online it may tell you the spaces aren't big enough for your rig - be sure to call them. All we had to do was unhook from our trailer. Located just on the edge of this very small town it is a very nice campground. Lots of in and out overnighters but, no long time campers. 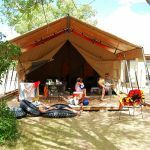 Has cabins, large rentalable tents, and tent camping sights. Pull through sights are a little close and a tree in our sight kept us from fully opening our awning. WiFi a bit slow at times, Verizon weak. Staff is fantastic folks always working on maintenance and improvements. Very quite area. The town of Panquitch is very quaint. Some dust problems but, for the location for sightseeing in the area this was a great stay. We camped at Panguitch KOA in a Fifth Wheel. I find KOAs to be pricey. Level, sunny site with full hookups and pleasant check-in. Well stocked convenience store. Dog run and playground. A ways from any activities in town. There's a central pavillion but not individual fire pits. 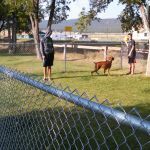 We camped at Panguitch KOA in a Motorhome. Verizon signal was great, didn't use wifi. Our main concern is Wi-Fi and pets, and this campground delivered on both. 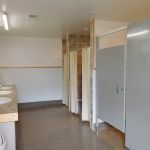 Nice pet area with enclosed off leash area as well as good Wi-Fi during our stay, minor disconnect issues and some lag but good by some campground standards. Restrooms a little on the older side so hard to tell how clean they are as some of it may be permanent staining. We camped at Panguitch KOA in a Motorhome. We stayed here for 4 days in July. It is the most cramped park we have ever experienced. The sites face each other, so you share a space about 8 to 10 foot wide, each with a picnic table. We had a noisy motorcycle group next to us, and the owners did nothing to enforce quiet time. Our awnings overlapped, the site was so small. The campground is old but clean. The owners are very nice, but we would look elsewhere for our next visit to Utah. We camped at Panguitch KOA in a Travel Trailer. Wonderful staff! We came in for 1 night during thunder storm. Got a level pull thru and was very grateful did not have to unhook. Very courteous and helpful! Level site. Older but clean bath with hot showers. Over 20 channels of good TV We camped at Panguitch KOA in a Motorhome. Nice park, owners were very friendly and gave us brochures on the scenic attractions in the area. Sites were level, not a lot of grass between the sites but they are working on fixing the park up. We stayed 4 nights and would come back again. We camped at Panguitch KOA in a Travel Trailer. We stayed in this charming small park for one night. It was very nicely kept, with green grass and trees for shade. The new (2 years) owners have done a very nice job making it an attractive park. The sites are fairly well separated, as is the case with most older KOA's, but most have a nice piece of grass alongside your rig, and all have picnic tables. We will certainly stop here again. We camped at Panguitch KOA in a Motorhome. 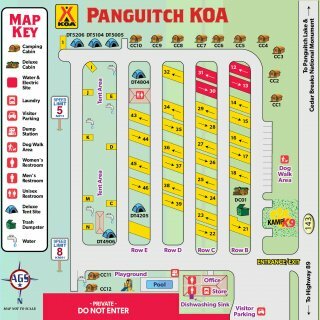 Are you affiliated with Panguitch KOA ?